The deaths raise to four the number of Palestinians killed since the IDF began a massive search for three yeshiva students. IDF troops shot dead two Palestinian Arabs in Judea and Samaria on Sunday in separate clashes that erupted as they made more arrests in the hunt for three missing teenagers. The deaths raised to four the number of Palestinians killed since the IDF began a massive search for the Israeli students who disappeared on June 12 while hitchhiking near Hevron. Israel accuses Hamas of kidnapping them, and has said the objective of "Operation Brother's Keeper" is to bring them home safe while dealing a crushing blow to the group's infrastructure in the biblical heartland. 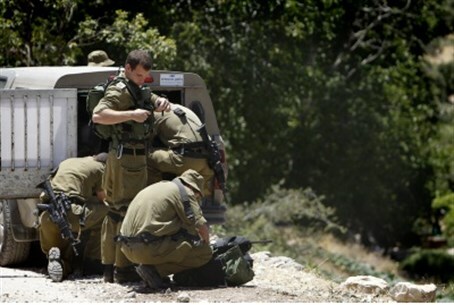 So far, the IDF has arrested more than 340 Palestinians, around two thirds of them Hamas members. Palestinian Authority (PA) chairman Mahmoud Abbas has denounced the abductions, but on Sunday said Israeli Prime Minister Binyamin Netanyahu should condemn the bloodshed triggered by the manhunt. "I said the kidnapping was a crime, but does that justify the killing of... Palestinian teens in cold blood?" Abbas told Haaretz newspaper, referring to two young Palestinians who died this week. "What does Netanyahu have to say about the killings? Does he condemn it?" Abbas added: "I have no credible information that Hamas was behind the kidnapping." Netanyahu, who insists Hamas abducted the youths, told a meeting of his cabinet that Israel has "unequivocal proof" and "soon this information will be made public." Abbas spokesman Nabil Abu Rudeina said the Palestinian leadership had begun efforts to call for "an urgent session of the UN Security Council to put an end to the ongoing brutal Israeli aggression". He told AFP that they are appealing to international organizations to "protect" Palestinians from Israel's actions. UN chief Ban Ki-moon, meanwhile, spoke to Netanyahu on Saturday voicing "deep solidarity" with the family of the missing Israeli boys, a UN statement said. But he also "expressed concern over the increase violence, mass arrests and restriction of movement in the West Bank." With the search now in its 10th day, troops shot dead Ahmed Fanawi, a 27-year-old mentally challenged man, in Nablus on his way to prayers, his family and medics said. The army confirmed firing at a man who approached troops "in a threatening manner", saying he had failed to respond to warning shots. But the military did not comment on the second reported fatality – Mohammed Tarifi, 30, who Palestinian medics said was shot dead during clashes in central Ramallah that wounded five others.